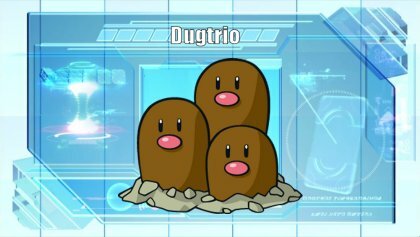 Dugtrio, The Mole Pokémon. While the three of them normally get along splendidly, on rare occasions a huge fight will break out over which head gets to eat first. Dugtrio’s heads are sleek and smooth and incredibly hard. It can dig through any soil with its headbutts. This set of triplets moves cooperatively. It’s the power of teamwork that enables this Pokémon to dig to a depth of 60 miles. Dugtrio has carved itself a niche as one of the best trappers in the game. Talking about Dugtrio is almost impossible without considering its ability Arena Trap: This allows Dugtrio to prevent a grounded opponent from switching (Ghost types are an exception). Arena Trap removes one of the core aspects of competitive Pokémon—the ability to switch—With this into account, Dugtrio's Arena Trap allows him to remove threats such as Heatran, Toxapex, and Magearna paving the way for another teammate to sweep. While Dugtrio's ability might be considered broken to some, Dugtrio itself still has it flaws. Dugtrio's defenses are non-existent and it provides no pivotal utility. Even strong resisted moves are able to hurt Dugtro badly. Also, without Arena Trap, Dugtrio becomes a mediocre Pokemon, which makes it one-dimensional and only being able to fulfill the niche of a trapper on the format it is allowed. • Arena Trap is the whole reason of Dugtrio's existence. It’s controversial ability of preventing opposing grounded Pokemon from switching allows it to nitpick certain Pokemon, like Heatran as an example, and remove it from the match after trapping it and OHKO it. 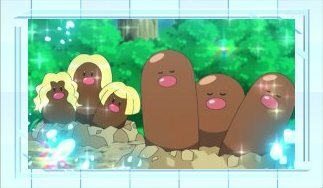 • On SM/USUM, Dugtrio gained a +20 base Attack boost. Now sitting at a decent 100 base attack, Dugtrio now is able to actually OHKO more threats compared to previous generations. • Dugtrio's pacey 120 Speed allows it to outspeed numerous threats like Mega Metagross, Magearna, Tyranitar, Jirachi and Blacephalon. This means that once Dugtrio comes in, they’'ll be most likely to be removed from the match as they'll have to eat Dugtrio's strong Ground STABs. • Dugtrio possess interesting coverage moves that allows it to pick something it can trap or hurt its switch-ins: Stone Edge, Aerial Ace, Sludge Wave & Sucker Punch just to name a few. 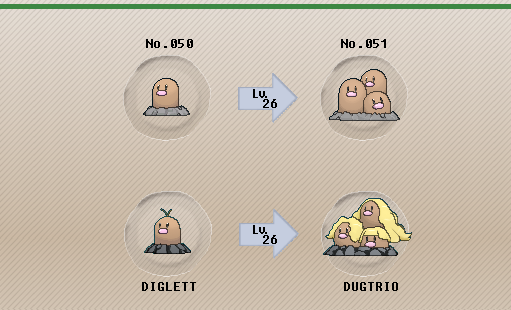 Dugtrio also has interesting utility moves like Memento, Toxic, Screech (to bolster its trapping abilities vs defensive Pokemon) and Stealth Rock. • Its presence on the battlefield forces the opponent to play differently, as one good double switch with Dugtrio could put them at a serious disadvantage. • A pathetic base 35 HP, combined with a base 50 Def and base 70 SpD means that Dugtrio can't take hits at all. Not even resisted hits. The only attacks Dugtrio can switch directly into are Electric due to the immunity of its typing. • With Dugtrio's paper thin defenses, strong priority attacks can definitely put Dugtrio on its place. • While Dugtrio received a buff on its Attack stat, base 100 is only decent enough to let him OHKO anything weak to Dugtrio's STABs or coverage option. Physical walls like Skarmory laugh at anything Dugtrio can throw. • Some formats disallow the use of Arena Trap due to its anti-metagame properties. Without it, Dugtrio is nothing more than a bang average Pokemon. Sand Force: Ground-type, Rock-type & Steel-type moves have their power increased by 33% in a Sandstorm - Very situational, but a lot more useful than Sand Veil. Compared with Arena Trap though, it's not that good. Once your opponents sees Dugtrio on Team Preview, they know how rough things can get if Dugtrio gets a chance of switching into something it can trap. Combined with a Z Crystal, Dugtrio's Tectonic Rage is strong enough to OHKO bulky Pokemon like Toxapex, Tyranitar or even Mega Metagross. Since Earthquake is more than enough for Dugtrio to accomplish its job, the other moves are used to provide the most utility possible once it has trapped and removed something in the match. Toxic lets Dugtrio cripple bulky foes like Tapu Bulu or Mandibuzz. Memento lets Dugtrio sacrifice itself in exchange of lowering the foe's Attack and Special Attack two stages which grants another partner an excellent chance of setting up. Stealth Rock can be used at the last moveslot to set up a hazard in case Dugtrio has nothing else to do before it dies. A standard offensive spread of maximum Attack and Speed allows Dugtrio to hit as hard and as fast as possible. A Jolly nature allows Dugtrio to outspeed threats like Mega Megatross & Gengar and trap them effectively. An Adamant nature is an option for more power if the extra speed is not necessary. With a Choice Band, Dugtrio gains more immediate power with the ability of being a more offensive threat towards the opponent. Earthquake is the main STAB and it will be the main move Dugtrio will be using to remove the threats you want from the opponent's team. Stone Edge is used to trap and remove Pokemon like Volcarona as well as being able to hit Flying types hard on the switch. Sucker Punch gives Dugtrio a decent priority move, however, Memento is an option once Dugtrio did his job and give another teammate an opportunity to set up. The last move depends on the user. Aerial Ace lets Dugtrio destroy Mega Heracross while Sludge Wave lets Dugtrio 2HKO Tapu Bulu. Pursuit can also be used to OHKO Latios if it flees. A standard offensive spread of maximum Attack and Speed allows Dugtrio to hit as hard and as fast as possible. You can shift the Def EVs to Special Attack only if you are running Sludge Wave. A Jolly nature allows Dugtrio to outspeed threats like Mega Megatross & Gengar and trap them effectively. An Adamant nature is an option for more power if the extra speed is not necessary. If you are using Sludge Wave, it's recommended to use a Hasty/Naive or Lonely/Naughty nature to power up the damage output vs Tapu Bulu if it is an specific threat you want to remove or weaken. With a Focus Sash, Dugtrio becomes an efficient lead and trapper. Earthquake is the main STAB Dugtrio will be using most of the time to destroy the Pokemon vulnerable to it. With a Focus Sash, Dugtrio can reliably set up Stealth Rock on the match as a suicide lead. Once weakened and brought down to 1 HP, Reversal becomes a 200 base power attack that allows Dugtrio to inflict massive loads of damage to Pokemon like Chansey or Mega Tyranitar. Once Dugtrio fulfilled its duty and has nothing else to do, Memento can be used to give another teammate an opportunity to set up. A standard offensive spread of maximum Attack and Speed allows Dugtrio to hit as hard and as fast as possible. There is no reason to invest on Dugtrio's other stats. In order to bring Dugtrio down to its Focus Sash immediately and power up Reversal, a Hasty nature is the preferred nature to make Dugtrio as vulnerable as possible. 21 HP IVs allows Dugtrio to survive two Seismic Tosses and bring it down to 1 HP exactly. 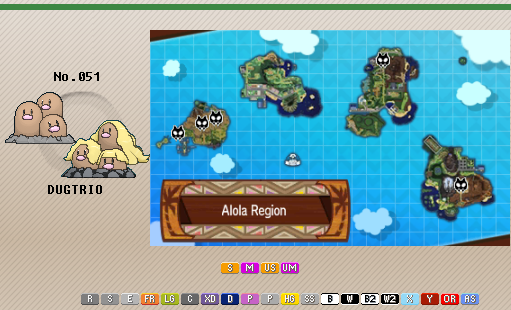 • Screech is an option on the Focus Sash set to give Dugtrio a better matchup vs defensive Pokemon like Chansey. However, Dugtrio usually prefers the utility of Memento or Stealth Rock. • Toxic can be used on the banded set to cripple Pokemon like Tangrowth on the switch-in. However, it doesn't hit the most threatening walls like Skarmory or Mega Venusaur. • Hone Claws is an option that can raise Dugtrio's Attack and Accuracy stats. However, Dugtrio is generally too weak and has very little opportunities to even set up. Dugtrio has no limitations under the doubles format, making Arena Trap completely kosher for this particular format. The only downside is that it won't be surviving many hits, even if damage control were to be provided by Intimidate support. Earthquake is a premier spread move under the doubles format, and hardly has any drawbacks. Protect helps with prediction. Stone Edge targets a single opponent that is unaffected by Earthquake. Alternatively, for a drop of power you can opt for Rock Slide. Stealth Rock chucks out a large portion of health for those who are weak against rock typed Pokemon, lowering the chances your opponent can effectively switch, though this is more effective in doubles formats allowing the whole team. Memento cripples a target which allows your ally to come in and potentially set up. - Groundium-Z creates a superb ground-typed nuke attack. - Pursuit could be chosen if you are looking to dent a Pokemon switching out. 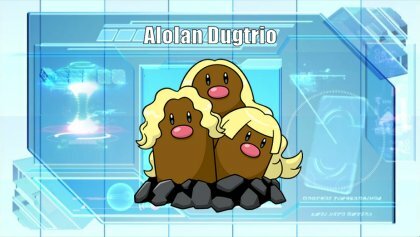 Alolan Dugtrio, The Mole Pokémon. Its metallic whiskers are heavy, so it’s not very fast, but it has the power to dig through bedrock.Its shining gold whiskers are advanced sensors that can detect vibrations from sounds several miles away. Its shining gold hair provides it with protection. It’s reputed that keeping any of its fallen hairs will bring bad luck. Reinventing the Dugtrio tricycle (pun intended), Gamefreak redesigned this Pokemon to be slightly more defensive, and slightly slower. To say the least, the changes implemented did not benefit Dugtrio's Alolan cousin. It is worth mentioning that Ground/Steel typing is not a terrible pairing, and it adds a couple of notable defenses. The only problem is that you are now exposed to common weakness such as Fire, Fighting, and Ground which tend to be ubiquitous under any format . +Ability offers Speed Control if it survives a hit. -Speed drop is not appreciated. Sand Veil: Raises the Pokémon's evasion during a sandstorm by one level. Some players might find abilities that raise evasiveness as not kosher. Tangling Hair: Lowers opponent's Speed by 1 stage when the opponent makes physical contact with the Pokémon. Potentially its only usable ability, given the exposure this form might get. Sand Force: Ground-type, Rock-type & Steel-type moves have their power increased by 33% in a Sandstorm. This could be used if you have an ally that sets up sand, keeping in mind that Alolan Dugtrio by itself is not bulky enough to be a worthy sand setter. This set showcases what little tools the trio Pokemon may display. The combination of Earthquake and Iron Head are its set of STAB moves that have utility by hitting hard certain Pokemon, and depending on which move used, levitators can have their health chipped away. Sucker Punch works well to dent Psychic-typed Pokemon such as Jynx and Alolan Raichu. Alternatively, Substitute protects Dugtrio from status affliction, and is also synergistic with Toxic. Pursuit is a great choice when you are certain that Dugtrio will force a switch. Memento cripples whatever stays in, allowing your following Pokemon to set up. Life Orb offers more power at the expense of smaller lifespan, while Leftovers offers more longevity at the expense of mediocre power. - Stone Edge has an important niche, catching flying-typed Pokemon off guard for nice damage.